PiTweaks is a collection of tweaks (and cheats, some might say) that I use on my server to make vanilla minecraft more awesome. Use the in-game Mod Options menu to choose which tweaks to enable. (For servers and for version 0.5.5 and before, edit config/pitweaks.cfg). Some of these are available on MC 1.11 as separate mods, and are linked accordingly. 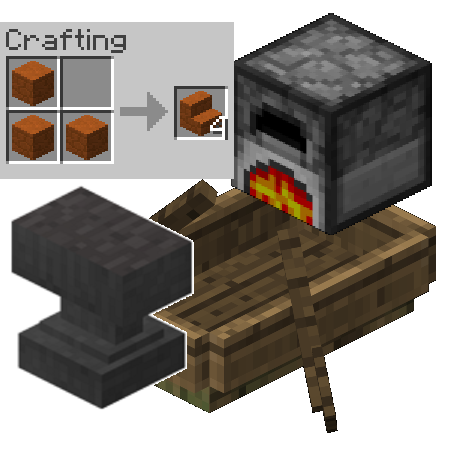 * Faster Vanilla Furnaces - Vanilla has crafting and smelting recipes. It always seemed odd that crafting would happen as fast as you could click ingredients, but it takes a whole in-game day to smelt a stack. With this tweak, all vanilla furnaces cook and consume fuel at 20x the speed (configurable). A piece of coal still smelts 8 items, but now it burns out in 4 seconds instead of 80. * Faster Brewing - Same as above, but this time with brewing recipes. Vanilla brewing stands take 20 seconds to brew a potion, but with this tweak you can set that to any amount, all the way down to 1 tick. Be careful if you set it too low; you might not have time to insert all the bottles before the brewing is done! * No Cumulative Anvil Cost - I like enchanting and repairing items using an anvil. But I hardly ever do it because it gets more and more expensive each time until eventually you can't repair the item anymore. Items in Minecraft keep a hidden tag called "RepairCost" that remembers how many times the item has been in an anvil and increases the XP required. This tweak clears that tag, so that you can repair an item unlimited times and the XP cost is always as if it was the first time the item ever touched an anvil. NOTE: If you load this mod into an existing world, you may need to break and re-place the affected blocks to get them to work. Is there any way of undoing all the the damage of faster brewers/furnaces without manually replacing them all? I wasn't aware that the latest version added faster furnaces, now there are a bunch all over the world that need to be undone. CplPibald's Tweaks is not compatible with AppleCore. The brand-new food and saturation tweaks are not compatible with AppleCore. If you turn those off, all of the other tweaks work fine. If you upgrade to the hotfix version 1.1.1, those tweaks automatically disable themselves when AppleCore is detected. Do you update your mod to 1.13.2? I really love it and especially the no anvil cost part. In the newest version, the in-game configuration now works. Use the Forge Mod Options menu and search for PiTweaks. Thanks for your interest! Why is my 'config' button grayed out in Minecraft? I am unable to select it in game to enable the mods. Is there anyway to fix that or do it manually outside of the game? You can do it manually outside of the game by looking through your config folder in the Minecraft instance that you have the mod installed in. If you are using the Twitch launcher, click the drop-down menu when you are in the profile of the modpack you are using and click 'Open Folder', you should be able to navigate from there. I finally got around to connecting the configuration to the in-game menu in the newest version (1.1.0). This should be MUCH easier to use now. Thanks for your interest! So, when it comes to the Anvil tweaks, is there a way to remove the restriction on how many times an enchanted book can be leveled up? Possibly in a future release? Please? and so on all the way up to level 32767...with no penalties. Also, if you decide do this can you do a configuration for that please and support modded enchantments? Done. Check out the newest version (1.1.0). A new tweak lets you completely uncap ALL enchantments in an anvil. Use the in-game configuration to turn it on. So how do I craft pressure plates now with the Slab/Stair tweak enabled? ._. By default it adds a 2x1 recipe using slabs. You can disable that recipe in the config if you'd rather use a recipe tweaker mod. You rock! Thanks for the 1.10 version! Hi! this seems like a very useful mod. but, I'm using a 1.11.2 version. could you give me some links to the individual mods adding this you mentioned? Been trying to test it but I was hoping if you could answer here. Are modded items included in the Anvil Cost tweak? Trying to wear out my mattock from Cyclic and so far no "too expensive" notice, but maybe I'm just too slow and haven't reached that limit yet. So are mod-added items affected?